Lighting is a fundamental part in growing corals and a successful reef tank. The right decision of LED lighting is not only amazing when you look at it, but serves also a specific function in growing your corals. 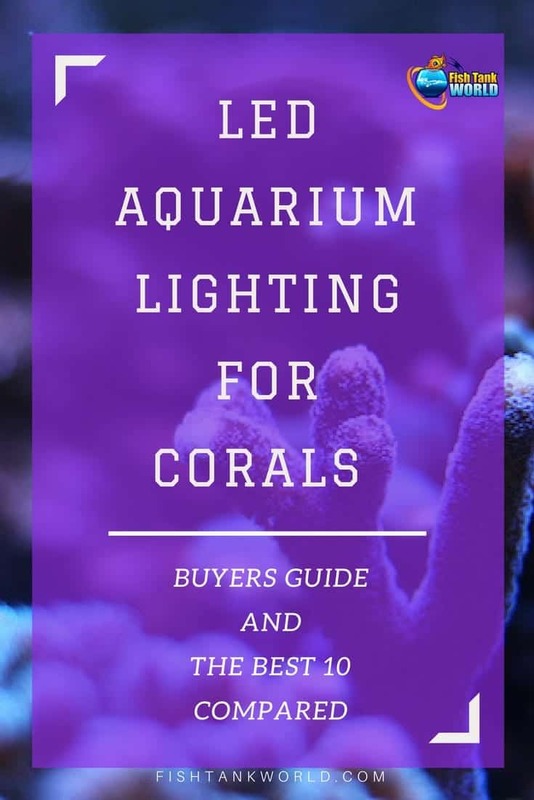 If you are to buy a led lighting for reef tank you want to make sure you know all you need to make an educated decision on the best LED aquarium lighting for corals which will work best for your Aquarium. 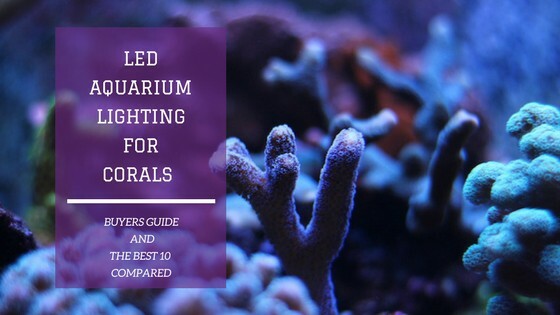 To help you in your research, we have put together a buying guide and compared the best reef led lighting systems available on the market. SPS which stands for small polyp stony. Play around with your colors. Research what colors benefit your fish. Maximize the beauty of your corals. Set up your own cycles. Don’t expose your LEDs to water. Don’t allow a build-up of salt or mineral deposits. Don’t overload your lighting mounts. Choosing to start a salt water aquarium rather than a fresh water aquarium means that you can choose to include soft or hard corals within your tank. Many people confuse corals as being inanimate objects or rocks, but this is a complete misconception; corals are in fact animals, which is why they require a specific environment in order to survive. Hard corals are typically seen as the easier of the two species to keep, as they are less sensitive to fluctuations in homeostasis within the aquarium. Though similar, most laymen are probably familiar with SPS species, which are the more commonly seen varieties in the natural world. Of the two, most people consider LPS corals to be easier to keep and maintain. 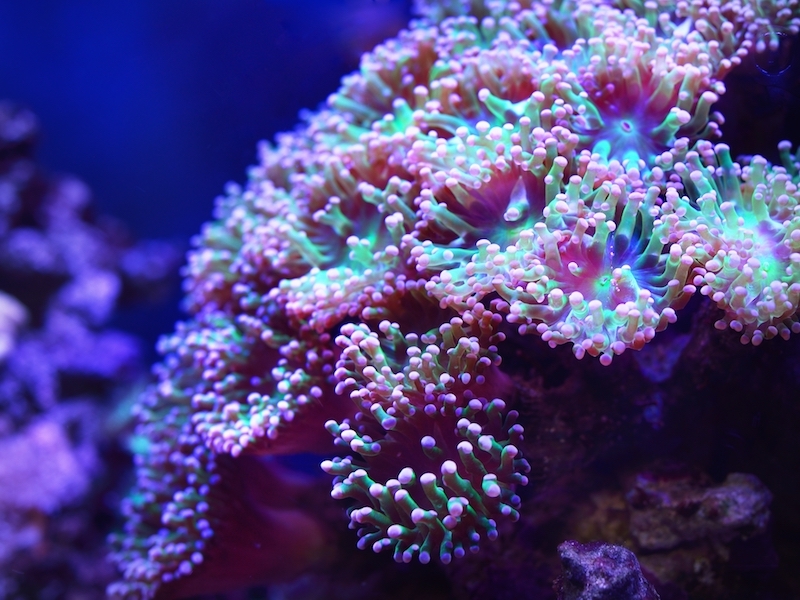 SPS corals are more susceptible to imbalances of nitrates and phosphates, as well as requiring a great deal of light, a strong flow of water, and being very sensitive to temperature fluctuations. Therefore, it is far easier to encounter problems with this variety. When it comes to growing coral for your marine, saltwater aquarium, the clear front-runner of the lighting options available to you is LED lighting. In comparison to alternatives such as fluorescent lights, LEDs have a number of advantages , including far greater energy efficiency and lower power consumption, the ability to support a full spectrum of color and other lighting effects, and vastly superior longevity and lifespan. To make the most of your new LED lights, we’ve put together a list of tips for choosing LED lights, as well as some things to do and things to avoid when setting up an LED lighting system. Consider the coverage offered by your LED lights. The shape and angle of the included lenses will directly affect the angle at which your lighting is projected. Typically, 90-degree angle lenses result in very focused light and less coverage in larger tanks. Consider what color LEDs a unit includes. The phrase ‘full spectrum’ means that a product covers all wavelengths of light. 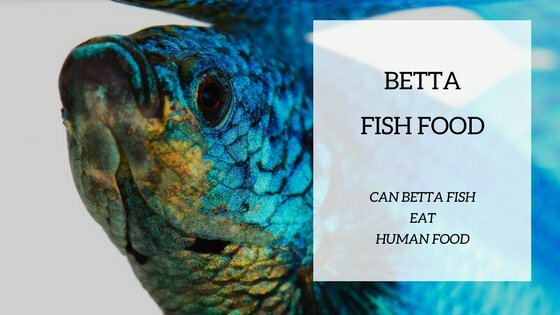 This is particularly useful in tanks where the inhabitants include fish, plant life and coral, as different wavelengths have different growth benefits for different species. 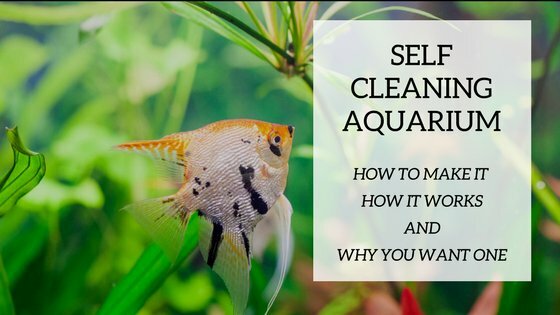 Think about how often you need to access your aquarium for maintenance, cleaning and other routine tasks. Consider how a mounted or hanging lighting system might impact on these actions and the best way to position the system around this. The full spectrum of colors offered by many LED lighting systems are not just for show, despite creating some very attractive tank effects. Using the appropriate wavelength of light for a particular growth stage of a coral’s life can increase growth considerably. Either way, whether you want an attractive looking tank or improved growth amongst your coral organisms, you should experiment with different combinations of LED light and research into tried and tested methods. LED lights traditionally come with dimmer switches, which allow you to tailor the exact level of brightness within your aquarium. They also allow you to blend different colors together, which can create different effects, promote the growth of numerous lifeforms simultaneously, and also extend LED lifespan by spreading the load across multiple LEDs. Finally, they also bring out the color in your corals and fish. As cooling fans and heat sinks on LED lighting systems are typically mounted on the reverse or sides of a unit, your lighting system won’t transfer heat directly into your tank’s water. That said, excessive heat build-up can damage LED components, leading to a reduced longevity. There are ways of preventing this build-up from becoming a problem, such as using a hanging light setup, avoiding canopies, or incorporating additional fans in smaller spaces where ventilation is poorer. It’s not just corals that can benefit from LED lighting. Some species of fish prefer varied levels of brightness and specific wavelengths of light. You may learn which of your fish prefer which types of light from experimentation within your aquarium, once you’ve set up your LED lights. Coral is a naturally-stunning organism with a wide spectrum of colors. Some LED lights bring out these colors better than others and really make them pop. To achieve the most impressive appearance in your marine aquarium, look for LED lights in the ‘actinic royal blue’ spectrum. For soft corals, often called ‘softies’ in aquarist circles, combine some magenta LEDs using a dimmer to control the combination of the two spectrums. Depending upon the product that you’ve chosen and the functionality that it supports, you may well be able to set up your own lighting cycles. Some products support pre-set cycling, whereas others will allow you to tailor your own using the built-in dimmers. Common choices include ‘day’ and ‘night’, or ‘daylight’ and ‘moonlight’, simulating high-intensity and low-intensity lighting cycles, respectively. Despite your LEDs being designed to sit in close proximity to the water within your aquarium, they are still not designed to get wet or be submerged. Such exposure to water over time could lead to corrosion of vital components, as well as electrical failures and short circuiting. Different models of LED lights can generate varying levels of brightness, though any good system will have a means of adjusting the light level used (usually referred to as a dimmer switch). With very bright LEDs, there’s a danger of causing burn damage to your corals if you move from a low-light environment directly to using a very high level of brightness. You should always start with a lower intensity setting, scaling up the brightness level gradually. The downside to salt water aquariums is that you can end up generating a lot of salt and mineral deposits over the course of the tank’s lifespan. 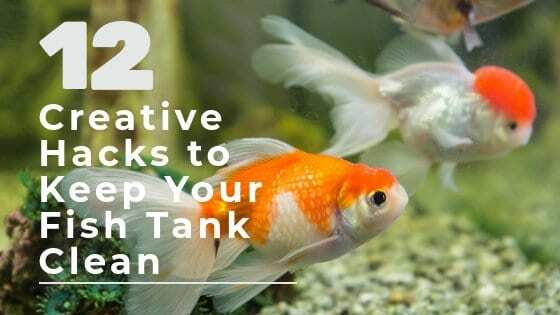 If not regularly cleaned from the tank, they can become a nuisance. However, if not cleaned from the lighting system, they can cause corrosion, directly reducing the lifespan of the LEDs and other integral components. Whichever way you choose to set up your lighting system, you should ensure that the load isn’t too heavy on its support structure. If hanging the LEDs above your aquarium, the last thing you want is for them to fall into your tank, simultaneously killing your fish and damaging your lighting system. Similarly, too much load on a rim-mounted lighting system could put stress and strain on your tank’s glass panels. The Hipargero Touch Control Light is specially designed for marine life aquarium tanks, with LEDs that are tailored towards the growth of almost any type of corals that you would find in saltwater aquariums. What’s more, the LED channels are dimmable and feature blue and white spectrum lighting; these LEDs are touch-controlled, with variable intensity that can be changed with a single touch. Keeping the whole unit cool is simple with built-in intelligent fans that tailor their operational speed to varying temperatures, ensuring that the LEDs are kept cool. Regardless of how fast the fans are running, they’re still incredibly quiet. If you like intuitive, user-friendly experiences in your products, then the Hipargero light is ideal for you with its touch-controlled LED intensity settings. As these are remembered when the light is powered down, you won’t have to deal with a lengthy setup process whenever you switch them on, too. Finally, the intelligent fan cooling system is a truly innovative feature, responding to temperature fluctuations by adjusting fan speed to cool more quickly where required. This is a feature that isn’t commonly seen in other lighting products. This LED aquarium lighting mounts directly onto the top of your tank using adjustable support legs. Although this makes it very easy to install, it also reduces access to the tank when you need to perform cleaning or maintenance, when compared to products with separate stands or mounts that sit away from the tank. However, this simplistic design means that there’s scope to expand the product with additional LEDs so it could realistically serve multiple aquariums of varied sizes if swapped around. Overall, the LED intensity is reported as being weaker than some competing products, however the price is also more affordable as a direct trade-off. If you’re the type of aquarist running multiple aquariums as part of a larger setup, then this could well be the lighting system for you. The ability to expand it with additional LED ports means that you needn’t buy an entirely new unit if moving to a larger tank. However, if you’re the kind of person who needs constant access to your tank, be it for cleaning or the regular introduction of new species to your aquarium, then the mounting system could become a hindrance to you. As is the case for hobbyists into hydroponics and grow-lighting, having the right LED lighting can speed up the growth of your plant life. With this product, a full spectrum of LED lighting specially targets all the growth stages of coral and plant life, optimizing their growth. During this time, you have complete control over the intensity of the LEDs through two adjustable dimmer switches, and heat build-up is countered by 3 built-in fans that disperse heat through the rear of the unit. This prevents any rise in water temperature that could compromise the health of your tank’s inhabitants. For larger tanks with widespread coral growth, this is perhaps not the first choice, as a 90-degree lens design focuses the light and reduced tank coverage. However, this does result in deep water penetration, so this unit would be beneficial for cylindrical or bow-fronted tanks in particular. The inclusion of red LEDs is less common in aquarium lighting as opposed to colors like blue and white, but they can be useful for growing plant life and bringing out the colors in certain species of fish. MarsAqua are known for their high-quality LED lights, though you’ll typically pay a little more than the average for the quality. Even on the lowest intensity settings, the Dimmable 165W LED Aquarium Light is capable of penetrating deep into tank water, reaching corals at varying heights, and several units can easily be chained together, creating a setup big enough to cover even the largest capacity of aquariums. Though the light is perfect for creating strong coral growth, it should be avoided with freshwater aquariums; in such setups, you’ll more likely suffer problems with algae growth, so keep these for the saltwater aquarium tanks. With both good light coverage and deep water penetration, the MarsAqua works well with aquariums of a variety of depths and sizes, though it’s best to keep this unit for salt water aquariums rather than fresh water tanks. The LEDs used in this lighting unit are extremely powerful and produce an intense brightness, though you’ll typically pay a little more than with other competing products. The cooling system also tends to run slightly louder than others, but this is generally expected given the intensity of the LEDs. The Phlizon 2017 LED light can be purchased in two assorted sizes, with one being suited to shorter, fatter tanks, such as bow-fronted models, and the other suited to longer, thinner aquariums. Both dimensions of tank are built from high-quality materials and provide real value for money. The difference in brightness at the lesser and greater end of the variable setting is large, though it’s unlikely you’ll ever need to run the light on its maximum brightness as a result. Aside from this excessive brightness, the only other fault to find with this model is in its temperature cooling system; just 2 fans are built into this model, and they can be quite loud when running. Depending upon the length and width of your tank, there are two different size Phlizon models to consider, but both are built to the same high standard. Setting up separate light cycles will not be a problem with the separate dimmer switches, and the sheer brightness of the included LEDs will easily allow you to create intense day and low-intensity night cycles for your tank’s inhabitants. You may be at risk of burning your coral if you run these LEDs too high, so ensure that you gradually increase intensity over time if opting for these lights. The Lightimetunnel LED Lights employ the use of 3-watt LEDs arranged in a formation of 55 bulbs. These consist of a full spectrum of colors, including 660nm red, 460nm blue, 430nm purple, 450nm royal blue, 520nm green, and warm and cool white lights. Two separate sets of controls mounted on the rear of the unit allow direct control over half of the LEDs each. Through the use of these controls and the variety in the LEDs themselves, it is possible to simulate daytime and moonlight environments. Finally, it’s worth a mention that the design incorporates 45mil Bridgelux white and 45mil Epistar blue LED diodes, which output 30% more light than competing models. With a full spectrum of LED lighting possible, you can use this lighting system to tailor your aquarium’s lighting to specific stages of your coral’s growth. The use of high-quality components also means that you can expect a 30% greater output than many other LEDs on the market, split into two arrays that can be independently controlled with separate dimmer switches. However, if you want timed cycles of varying intensity, then you’re going to have to pick up a timer separately as one is not included with this product. With two power cords, easy to understand instructions and a supplied hanging kit, the Euphotica Dimmable Light Fixture is easy to set up straight out of the box. However, if you’re not keen on hanging your lighting unit directly above the aquarium, you may have more difficulty with this product. The light includes an LCD touchscreen that makes it incredibly easy to adjust and program your preferred settings, even if you do have to reprogram them. This product could certainly benefit from having an internal memory system for remembering past settings and cycles, as well as a more varied method of securing the lights. However, a hanging kit is included with the system, plus the setup is clearly explained through detailed, easy to understand instructions. What’s more, this lighting unit includes a programmable LCD touchscreen. If your settings are lost, then they are at least easy to set back up using this unique feature. The Bloomspect 165W LED Light system, like others, uses Bridgelux LEDs, which are industry-leading LED bulbs with incredible brightness. As a result, and when combined with a 90-degree lens design, the light can penetrate tanks of great depth. The trade-off is that their coverage suffers slightly, something worsened by the fact that these units cannot be daisy chained together. Still, the components used are of a very high quality and do not bump the price of this product up unreasonably. All of this creates a well-rounded LED lighting product that would work in a variety of tank sizes. With Bridgelux LEDs underpinning the design of the BLOOMSPECT 165-watt unit, you can be sure of high-intensity brightness that will penetrate deep into your tank, though coverage isn’t quite as good. To counter this increased power, the included heat sink is combined with the built-in fans to ensure that excess heat does not damage your LEDs. To round things off, a 3 year warranty ensures that even if anything were to go wrong with your product, you have a window in which to return it that is 3 times longer than most similar product manufacturers would offer. The Aqua Air 20W LED Lighting is an ideal product for the entry-level hobbyist or aquarist with only a small aquarium tank. Built-in mounts reduce the need for any cumbersome hanging system, though do limit the options available for setting up the lights. Still, this ensures that the tank is always easily accessible for any cleaning, maintenance, or access to other equipment such as filtration media. Despite its small stature and cheap price tag, there are a range of pre-set and customizable settings, including some that are included for aesthetic purposes, such as the ‘thunderstorm’ setting. This product is quite unique in comparison to the other LED lights on our list, as it uses a tank-mounted pair of adjustable legs to suspend itself above the tank. Constructed from aluminum, it is also corrosion resistant. Ideal for entry-level aquarists with small aquariums, this unit comes in very cheap. Unfortunately, you do lose some functionality by paying less; alternative options for hanging or supporting this lighting unit are non-existent and there are fewer LEDs, meaning that a full spectrum of light is not supported. This LED lighting unit has a very low level of power consumption compared to similar products in the industry. That said, the light does not skimp in other areas; the design is high-quality, constructed from aluminum, which offers greater corrosion resistance than plastic. Despite this benefit, the product still needs to be kept out of direct contact with water, as the LEDs are not waterproof by any means. Speaking of LEDs, this product has a full spectrum of wavelengths, including blue, white, red and green, giving you full control over the growth of your corals. The ICOCO light is a good-quality light overall, though lacking in any special functionality to set it apart from competitor products, particularly given that it commands an average to high price tag. However, it makes the list as does have several plus points, including an aluminium frame that is resistant to salt water corrosion, a full spectrum of light wavelengths for targeted growth of coral and plant life, and what’s more, it is environmentally friendly owing to its very low power consumption. 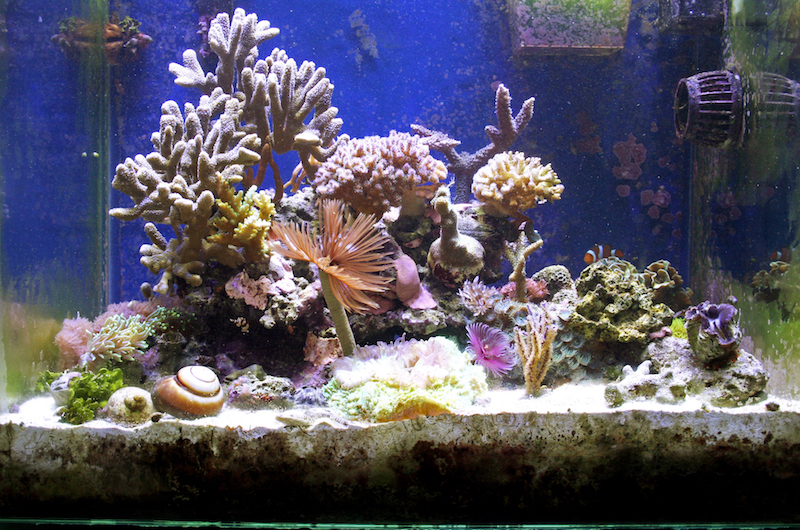 If you’ve chosen to start a saltwater aquarium, then you may well have chosen to populate your tank with corals. These organisms not only need light, but can benefit from certain wavelengths, too. Through the utilization of LED lighting, and by choosing the correct intensity and color of LEDs used, you can speed up the growth cycle of your corals and achieve a bigger, healthier size. Once your corals are established, then it’s simply a case of maintaining homeostasis within your tank’s water, adhering to the chemical balances outlined above. Always consider how a lighting system will fit within the constraints of your aquarium setup, including how it will be hung or positioned, the size and number of LEDs required for your capacity of tank, and the coverage or spread offered by the lighting system. When it comes to value for money and propagating coral growth, choosing a full spectrum product is generally the best option.